Table tennis may seem like a simple sport to you but has a horde of health benefits. Played at full speed, the sport is an excellent way of burning extra calories and keeping fit. Aside from that, it improves the eye-hand coordination, promotes better reflex, improves stamina and keeps your brain sharp. What’s more, it’s a fun sport for enjoying time with your buddies or even the family. So you’re looking to buy a ping pong table? It may be as simple as knowing what you need, walking right into the store and picking one. Well, not that fast as not all tables are created equal. The market is awash with different brands and types of tables, all at varied prices. In the light of this, it can be confusing and frustrating to select the best ping pong table. What should you look for in a good table tennis table? Keep reading to find out. 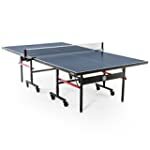 Best Ping Pong Tables for the Money (2017 - 2018) - Our Favorites! 1. Who’ll be using the table? While the manufacturer may not be forthright, there are tables suited for office use, clubs, school or even home. If you have small kids, you want a sturdy unit capable of withstanding their roughness and playful nature. An office table should be made of high-quality materials, so it’s robust enough to accommodate players of different skill levels and regular use. A school table tennis table is bound to undergo lots of battering from students. School kids will sit on them, kick them, stand on them and do all manner of stuff. Cheap flimsy units can’t survive such a harsh environment. You’ll need the highest quality you can come across, so the investment lasts longer. 2. How much do you intend to spend? If you just need a table for a family fun time, then it doesn’t make sense to spend a lot on a single unit. You want beginner table where you can while away time on a lazy afternoon with no emphasis performance. For those who want to practice and hone their skills, a table that offers a tournament bounce may be your best bet. 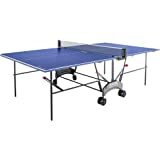 If you’re tight on budget, you can choose a mini or a compact table tennis table that won’t cost you a lot. Where space needs to be optimized, a movable table is your best bet. You only need to set up in minutes, enjoy your play and then fold it up for compact storage. Something wonderful about owning a mobile unit is that you can use it anywhere provided there’s space. If you plan on maintaining your table probably in the basement or the garage, then, by all means, go for a stationary unit. In this case, you’ll need to designate a place where you can set it up permanently. The good thing about stationary tables is that they’re usually sturdier and even more attractive compared to the mobile tables. 4. Is it for indoor or outdoor use? 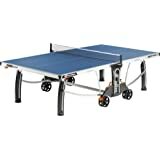 There’s the temptation to dismiss the possibility of playing tennis in the outdoors when purchasing a ping pong table. You only come to realize it later. In this case, you can consider a unit with rollaway wheels that can work both indoors and outdoors. You cannot assume the fun that comes with enjoying a nice play on pleasant weather day. If you insist on an indoor table, then be sure consider the interior design of the room. 5. How often will it be used? An office or school ping pong table will have a multitude of users with different skill levels. In that case, you’ll a unit made of industrial quality materials so it can last longer. 6. Do you have sufficient space for the table? This question applies if you’re planning to buy an indoor ping pong table. You can purchase a full sized table if you have plenty of space in your home. A compact or a mini table is your perfect choice if you have limited space. 7. What is the skill level of the users? Beginners are casual players just there for fun and working their way to learning the rules of the game. 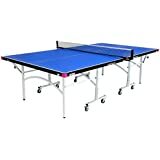 Ping pong tables designed for beginners are majorly meant for recreational use and not performance or technique. Intermediate players need units that can stand long hours of play. So, they have to be heavily built. Advanced level players need top-end tables that can guarantee consistent bounce rate. Killerspin is a table tennis table manufacturer that has even funded tournaments and events. They design some of the most premium tables perfect for advanced or pro players. 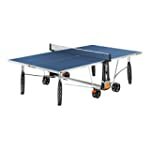 Table tennis tables come in different varieties, and while the sport is usually indoor, you can still enjoy the fun in the outdoors. If you don’t plan to limit your play to the outdoor, go for an indoor ping pong table. Indoor tables feature the ideal smooth playing surfaces. 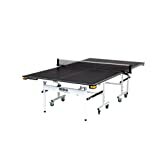 At no given time will an outdoor table replicate a top end indoor ping pong table when it comes to the bounce or the game quality. But if your table is just fun, probably the bounce rate is not a big deal. You’ll also find indoor tables designed for indoor and a short span outdoor use. And while they can be used in the outdoor, if kept under direct sunlight for a long time, they get warped. That can affect the smooth movement of the ball. They may also get damaged fast due if kept in a damp room. If you plan to put your table in the garage, consider an outdoor table. Indoor tables are best kept in mildly heated and insulated rooms to prevent damage. Any unit used designed exclusively for outdoor use comes already weatherproofed. It features high-quality materials capable of withstanding the elements such as gust from of the wind, snow, rain and more. Plus, an outdoor ping pong table offers you unmatched flexibility as you can use it inside if you have enough space. A cheap model cannot survive the harsh conditions experienced from time, to time and you might want to check the best brands. Kettler makes heavily built weather resistant table tennis tables perfect for the outdoors. Tables tennis table covers are not sufficient when it comes to protecting your table in the outdoors. As such, there’s no assuming that you can purchase an indoor unit that’s not weatherproof, cover and leave it outside. Convertible top tables – these are the beginner and intermediate tables that feature a playback position. Such a unit allows a single player to practice by raising one side of the table up to form something similar to a blackboard. An inexperienced player with no accurate hits can then practice returning the ball. Rollaway tables – these tables feature chassis on wheels that makes it possible to folds the two halves of the units for compact storage. Make sure you choose the model with robust flames for durability. 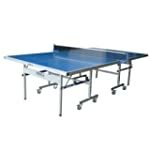 The Butterfly is a good ping pong table brand that manufactures top quality units, weatherproof and with a high bounce rate. Not to forget the ease of folding and unfolding. Stationary table – this type of table is ideal when you’ve made up your mind to commit a particular space to playing tennis only as they occupy lots of space. Most outdoor ping pong tables are stationary. Something cool about these tables is that they tend to be heavily built and hence more stable. 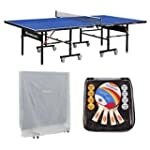 When choosing a table tennis table, probably the first thing to consider is the playing space. The dimensions of the table will influence your decision. The room size will determine the length, width, and height of your unit. Remember that you’ll need enough movement room to play. Per regulations, a table should measure at least 9ft long, 5ft wide and 21/2ft high. Then the net extends another 6 inches on either side and above the table. If you don’t have all the space for yourself, then you need at least 5ft between you and the barrier behind you and a minimum of 3ft on either side of the ping pong table. That way, you can avoid bumping into walls and other stuff as you play. When playing in the outdoors mostly, the chances are that the ground or even the floor may not be entirely level. This shouldn’t be a problem. Some units feature feet adjusters that you can adjust independently to keep the top of the table level. Stability of the unit will determine the quality of your play. Some ping pong tables come with round legs while others feature square legs. Be sure to go with the square heavy gauge wheels any day if you can choose for better durability and stability. And while a table with slender legs will come with cross bars for additional stability, durability comes with selecting a unit with solid legs. Maybe you think that since you have limited room in your home, there’s no way to enjoy your beloved game. It’s perfectly understandable to have an insufficient room which is why there’s a solution for you. With a portable indoor ping pong table, it will just require a few of your minutes to assemble. Once you have finished the play, fold it down and store until next time. If you want to identify a perfect table from a distance, then check the thickness of the tabletop. Most tables have a thickness ranging from 12mm to 25mm with the quality getting better with an increase in thickness. On a thin table, say 12mm, the ball doesn’t bounce properly, and the bounce is never consistent. Not only that – the table is so thin that it can easily break. Such a table left to kids won’t last a month. Table tennis tables with a thickness between 22mm and 25mm are the best and highly durable. But if you’re not looking for a tournament bounce and sophisticated techniques popular with advanced players, a 16mm to 19mm table will be fine. A foldable table is good when you want to optimize the use of the available space. It gets even better when it comes to moving from one place to another. You want a unit that you can set up in a few minutes, enjoy your game and dismantle as fast as possible. At all times, go for the tables with rollers. 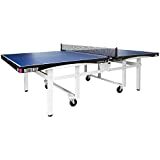 Stiga ping pong tables are your best bet if you want a quality table with a consistent bounce and one that guarantees ease of assembly and disassembly. Over time, ping pong tables have undergone immense transformation and makers now design units with the safety of the users in mind. Modern units come with safety features such as protective corners, locking wheels to prevent sudden movement, storage positions, and convenient transportation capabilities. Be sure to purchase a unit that you’ll be comfortable when enjoying the game irrespective your skill level. Today, some manufacturers are designing tables with a holder incorporated into a frame. You can opt for such a model for the convenient storage of your accessories, so you don’t lose them easily. The color is a crucial consideration when choosing your table. By all means, go for the color that offers a proper contrast with your play space for the best visual experience. If the floor is reddish, matte blue color is usually the best bet. In fact, the International Table Tennis Federation (ITTF) now approves only the tables that have a dark matte finish. For most of the ping pong tables, the net posts are usually stationary meaning they’re permanently attached to the table. However, it’s still possible to change the net when the time comes. Other tables come with removable net posts that you can detach after the play. That increases the storage convenience. Some brands feature a heavy gauge steel rail that not only contributes to the appearance but also provides additional support and stability. Without a doubt, your choice of ping pong table matters. And whether you choose an indoor or outdoor table, be sure to focus on the strengths and downsides of each. After that, consider your skill level or even the purpose, then focus on the features you’d love and go for a quality brand that offers precisely that.